First page of the March 1979 issue of The Informer newsletter. For many years libraries were purposefully segregated, with branches tacitly or overtly meant to serve an African American neighborhood or community. The Richard B. Harrison Library in Raleigh is an example of a library that was a true social force, due to the hard work and influence of librarian Mollie Huston Lee. I thought of Ms. Lee recently. I was doing some work in our scrapbook collection, when I came upon an interesting newsletter tucked into one of the Irwin Holmes scrapbooks from the Durham County Library. Titled “The Informer,” the newsletter’s tagline is: “For Recruitment of Minority Librarians” and appears to have been published first out of Raleigh and then out of Fort Valley, Georgia. There are two (possibly two and a half) issues in the scrapbook: one dating from March 1979 (pictured at right) and the second from September 1983. 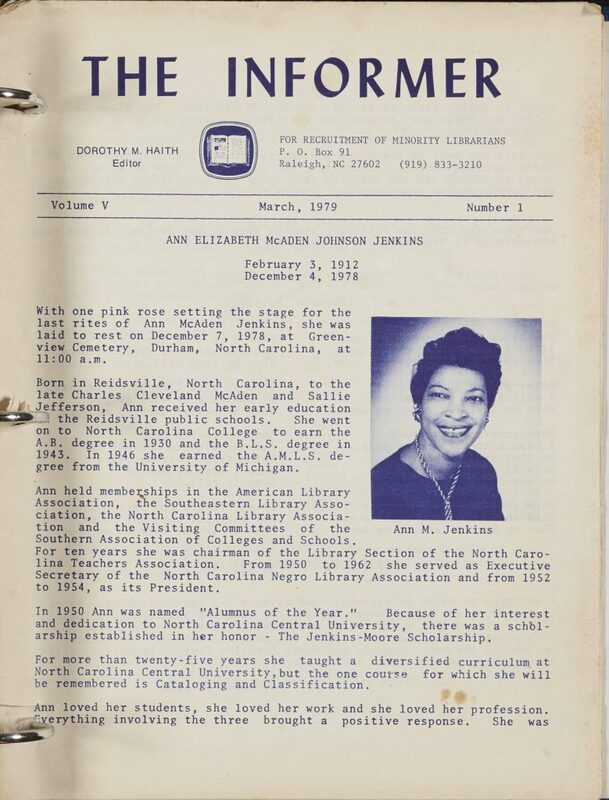 The issues of The Informer in our collection give biographies and moving tributes to African American librarians, such as Ann M. Jenkins of NCCU and Edna “Pinky” Penolya Mcaden King Watkins, an NCCU graduate who worked in libraries around the country. They also list positions available in North Carolina and around the country. The Informer publisher, IESMP or “Information Exchange System for Minority Personnel,” sold a number of other publications that offered to help librarians find jobs at institutions friendly to hiring minorities. Dr. Dorothy May Haith was The Informer’s editor and possibly publisher, and she has had a lifelong passion for improving the profession and her community. A Shaw University and North Carolina Central University alum (she also holds degrees from Indiana University), Haith led the library at Bennett College, and also at Howard University. She has a number of publications to her name, has served on professional boards, and has given back to educational institutions by endowing scholarships. The Spring 2011 issue of Windows, published by the University Library at UNC Chapel Hill, describes a gift made to Wilson Library by Haith to honor those she felt encouraged her education (we call Wilson Library our home). 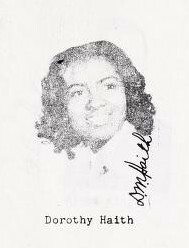 Dorothy Haith’s high school yearbook photo from Booker T. Washington High in Reidsville, N.C. Through The Informer, Haith was building a network for minority librarians through the 1970s and 1980s, offering them professional resources and personal information about their peers. Though Googling gives most of us this benefit now (as it did for me when trying to find out more about Haith), before the internet, this was a true labor and a valuable service. Recruitment of minorities and increasing diversity continues to be a great need. What many patrons may not realize is that libraries strive to be some of the most inclusive, safe spaces in the country. Many build towards that goal in numerous ways: through concerted efforts to recruit a diverse workforce, through selection of an inclusive and various group of materials for collections, and through ensuring libraries are safe for ALL patrons. In fact, the American Library Association, the national professional organization for librarians, reinforces these goals through a code of ethics, professional development, and scholarships. As a profession, we have a long way to go, but these steps get us closer. At DigitalNC, we hope to identify and help share more collections from our partners related to North Carolina’s minority populations in the coming year. If you work at a library or other cultural heritage institution and have collections that fit this category that you’d like to share online, we’re eager to hear from you. *There’s also a rich Library History digital collection from the State Library of North Carolina, over at digital.ncdcr.gov. **NCCU has numerous issues of The Informer in their collection, available at the School of Library and Information Sciences Library.